The Seventeenth Judicial District Commission on Judicial Performance unanimously recommends by a vote of 9-0 that Judge Katherine Delgado BE RETAINED. 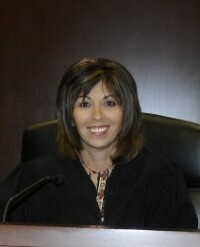 Judge Delgado, a District Court Judge in the Seventeenth Judicial District, was appointed to the District Court bench in July 2002. Prior to her appointment, she practiced corporate law and was a Chief Deputy District Attorney in Boulder County. She graduated from Colorado College in Colorado Springs with a Bachelor of Arts Degree in Political Science and History in 1979 and obtained her Juris Doctor in 1983 from Denver College of Law. Judge Delgado is dedicated to the continued improvement of the judicial system, serves on multiple committees outside of her regular duties and was awarded the National CASA Judge of the Year for her work in the juvenile area in 2013. Judge Delgado finds it extremely rewarding to help juveniles attain positive change in their lives and at the same time lowering recidivism in the state. The evaluation methods used by the Commission included a personal interview with Judge Delgado after reviewing Judge Delgado’s self-evaluation, reviewed legal opinions she authored, observed her in court, and reviewed survey responses regarding her performance. Among the survey questions was “how strongly do you recommend Judge Delgado be retained in office, or not be retained in office?” Of the attorneys completing the survey, 100% recommended to retain, 0% not to retain, 0% made no recommendations regarding retention. Of non-attorneys completing the survey, 93% recommended to retain, 7% not to retain, and 0% made no recommendations regarding retention. Judge Delgado presided over domestic relations, civil, juvenile, truancy and criminal cases during this term. Survey responses indicated that she received above statewide average scores among all district judges standing for retention in 2016 from both attorneys and non-attorneys responding to the survey who had interacted in her courtroom. The overall message throughout the survey was that Judge Delgado is a true asset to the District through her knowledge and application of the law, case management abilities, professional demeanor, and communication skills. The Commission, through courtroom observations, found Judge Delgado to be a compassionate judge who listens and considers the facts of the case. The review of several of Judge Delgado’s opinions were found to be clear, thoughtful, and well-reasoned. The Commission unanimously recommends that Judge Katherine R. Delgado BE RETAINED.